Carolyn Lindstrom: I have been in education for 27 years, beginning as a substitute teacher. I have taught 7th/8th grade general education, and was a private, alternative, high school Director/Executive Director. I have been with La Mesa-Spring Valley Schools since 2008, teaching students with moderate/severe disabilities, with the last three years at Spring Valley Academy. In addition to teaching, I am also an adjunct professor for Brandman University, teaching general and special education credential teachers. I have two masters, Education Administration and Special Education, and a Doctorate in Organizational Leadership. I have written articles about best practices for teaching students with disabilities in an inclusive setting. I have written a book “What’s Missing? Best Practices for Teaching Students with Disabilities.” This action research proposal will continue my quest to ensure all students, regardless of learning or physical challenge, can access the curriculum and be positively contributing members of their community. James Villegas: I have been a musician for over 40 years and a teacher for about half that time. I should say that music is actually my 1st and 3rd career path, with that middle stretch being a ‘real world’ stint with an international mineral exploration finance conglomerate. My education background includes a degree in music from Pepperdine University and graduate study at Western Washington University. Performance ensembles include the 15th Field RCA Regimental Band, the Pacific District Military Band, the Marylhurst Symphony Orchestra, and a variety of bag band and other groups. I am currently the band director and music teacher at Spring Valley Academy. The goal of this action-research project was to determine whether inclusion by forming partnerships between students with and without disabilities had a positive effect on students’ perception of peers with disabilities. Through surveys and observations of students with (n = 12) and without disabilities (n = 23), it was determined that students’ perceptions evolved throughout the school year and created a more inclusive environment. The environment created reflected an increased percentage of students choosing to be involved in the music class and decreased negative perception of students with disabilities. The program was originally set up with and operated in partnership with United Sound, a national organization that promotes music programs for students with disabilities to perform with students without disabilities. As our program evolved we included pedagogical methods in keeping with standardized music education and appreciation, which can be accessed by any music program with minimal adaptation and front-loading. The program was expanded to include students with severe physical and mental disabilities that required a more kinesthetic approach to teaching and learning. The purpose of the project continued to be in alignment with Spring Valley Academy’s core philosophy of an International Baccalaureate Learner; that is, Inquirers, Knowledgeable, Thinkers, Communicators, Principled, Open-Minded, Caring, Risk-Takers, Balanced and Reflective. Students enrolled in the class achieved developed relationships with other students, broke down barriers of learning and developed interpersonal communication skills that are not typically found on a public school campus. The action research demonstrated that when students with and without disabilities work together, perceptions of people change. 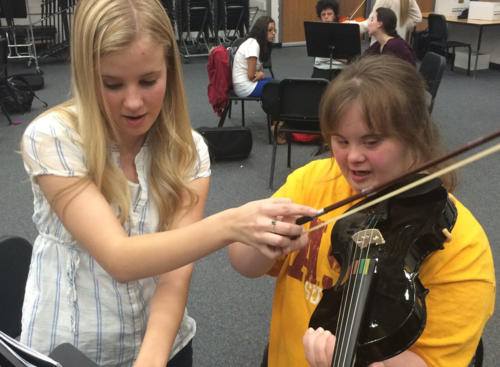 Research on a fully inclusive music program is important to undertake in the current school setting because of our growing population of students with special needs and our determination to have those students participate in a fully inclusive elective where their “can do”s and social/emotional needs are met. Although research studies on full inclusion experience in music classes have been conducted, these studies involved either one special needs student (Luxton, 2001) or blind or visually impaired students (Moss, 2009). The current study examined a different approach to a full-inclusion music program such as creating partnerships between peer mentors and special needs students to examine the effects of the new approach (see below for details). This practitioner-research is relevant not only to this school but many schools that face similar challenges. The research examined if a fully inclusive music program would allow for students with and without disabilities or with special needs to learn and perform music together, removing barriers of classification and labels. If feasible, such an undertaking could create a culture of inclusion within the current school and lead to the creation of a similar class in other schools in this and other school districts across the U.S., and possibly in other countries as well. For the purpose of this research, we created the mentor-student relationship among students. Students without disabilities were “mentors” to students with disabilities (“students”). Mentors and students worked together to develop the class structure. Through this collaboration of students the project can move beyond the classroom walls and provide multiple public performances throughout the school year for the school community, including public performances for the whole community. In this practitioner-research, we provided a full Inclusion music class that bridged the interaction of students with and without disabilities and enabled those students to engage in a common learning activity that encouraged them to develop relationships to work together for a common purpose, that is, performing in front of an audience. The effect of this innovative program was examined using data from student survey, teacher observations, and student reflections. Students (N = 35) participated in this research project. There were two groups of students, with 23 students from general education and 12 students from self-contained special education class (SDC). Of the students from general education, fourteen were 7th graders and eight were 8th graders. Of the SDC students, seven were 7th graders and five were 8th graders. Each year, the general education students are allowed to choose an elective for the school year. Of the 23 students, seven students selected this music class as their elective, whereas 16 did not choose the class as an elective. If students do not choose an elective, or enroll in the school after the registration deadline, they are assigned to a class. The 16 students were assigned to the music class by the school counselor either days before school started or on the first day of school. The SDC students were assigned to the class by their teacher. This section describes how partners were created, how the partnership worked, and class activities. Creating partners. On the first day of class, students without disabilities were identified as “mentors” and students with disabilities were identified as “students.” Students with (n = 12) and without disabilities (n = 23) formed partnerships. During class, students worked together to learn how to read and play and perform music together in an inclusive environment, which culminated in performances throughout the school year. How the partnership worked. Each “student” was paired with one or two “mentors” to learn and practice together during the class. The mentors were responsible for the student’s performance in the class. As the school year progressed, groups of students, mentors and students, were created to allow small group instruction for both the teachers and the mentors during certain lessons. Mentors were responsible for students learning to count beats, read music, and perform using instruments. The mentors were changed halfway through the year to allow them to work with different students. This was determined through student reflections and teacher observations. Many times, the mentors became “too” comfortable with the students, or vice versa, and the level of familiarity would sometimes result in more discipline issues for both parties. Changing around students allowed new perspectives and the ability to learn how to differentiate instruction, based on the learning needs of the student. Class activities. The class began with clapping beats of notes, both reading and clapping. Soon, “Boomwhackers” were purchased to help with developing musicality and performance of songs. Boomwhackers are long pipes, made from plastic that illicit a certain tone depending on length. Musical sheets, with different colored notes, help students to learn how to read music. Halfway through the year, bells were purchased to add to the Boomwhackers. The bells and Boomwhackers matched in color and pitch and could be used almost interchangeably, depending on the sound. Three types of data were collected: Student survey, teacher observations including discussion groups conducted by the Band Director, and student reflections. Item 4. Before the first day of school, how familiar were you with students with disabilities? Extremely Familiar. I have a family member that has a disability. Very Familiar. I had been friends with them before. Somewhat Familiar. I had seen them at school but never really hung out with them. Not Familiar. I had never seen them before. Item 5. Before the first day of school, how comfortable were you with working with students with disabilities? Extremely Comfortable. I have a family member that has a disability. Very Comfortable. I had been friends with them before. Somewhat Comfortable. I had seen them at school but never really hung out with them. Not Comfortable. I had never seen them before. Item 6. By Winter Break, how familiar were you with students with disabilities? Item 7. On the first day of school, how much did you want to be a Peer Mentor in music class? I wanted it a lot. I signed up right away because I knew that was what the class was about. I kind of wanted to be in the class because I like music. I was willing to be in the class but I didn’t know anything about the class. I did not want to be in class. The counselor made me. Item 8. By Winter Break, how much did you want to be a Peer Mentor? I still wanted it. It was exactly the class I wanted. I kind of want it. I am learning to appreciate the class. I am willing to stay in it. It is not too bad. I do not want to be in the class. Item 9. Do you think you have improved as a Peer Mentor since being in Sonic Expressions? No, I have not improved. The data from the survey questions were analyzed and frequencies and percentages were compared, where appropriate, to examine increase/decrease in student perception of class and students. Teacher observations. Teacher observations, in the form of video recordings of classroom engagement, were randomly performed throughout the school year. The observation data were used to find changes in the level of interaction between mentors and students across the school year. These videos were also shared with administration to demonstrate changes in student interactions and to encourage continued support of the class program. The videos were taken during various classroom rehearsals of music, when the class broke off into groups and mentors were asked to “teach” their partners a new sequence of notes, and during spontaneous/impromptu “jam sessions” with bells, boomwhackers, or drums. Student reflections. Reflections of the students without disabilities (mentors) were gathered so that adjustments to instruction could be implemented. Students were asked to reflect in private journals once a week to share their thoughts and emotions about being a mentor. Discussion with the Music Teacher would follow to address any major concerns stemming from the reflections. Change in instruction was necessary to reflect increased student compatibility, comfort level, as well as music abilities. Results of the research project were determined from three sources – Student Survey, Teacher observations, and student reflections. Students’ responses to questionnaire items. Student responses indicated positive effects of the inclusion program. On the familiarity and comfort levels of regular students toward students with disabilities, self-ratings increased dramatically after the inclusion program as shown in the counts and percentages. Before the first day of school, 2 (8.70%) students were extremely familiar with students with disabilities, followed by 1 (4.35 %) student (very familiar), 12 (52.17%) students (somewhat familiar), 1 (4.35%) student (not familiar), with 7 (30.43%) students not having an opinion on this question (Item 4). Also, before the first day of school, 2 (8.70%) students were extremely comfortable with working with students with disabilities, followed by 2 (8.70%) students (very comfortable), 8 (34.7%) students (somewhat comfortable), 4 (17.39%) students (not comfortable), with 7 (30.43%) students not having an opinion on this question (Item 5). About 13% to 17% of the regular students rated themselves extremely or very familiar or extremely or very comfortable with students with disabilities. However, by Winter Break, 10 (43.48%) of the students were extremely familiar with students with disabilities, followed by 10 (43.48%) students (very familiar), 1 (4.35%) student (somewhat familiar), 2 (8.7%) students (not familiar), with no (0%) students having no opinion on this question (Item 6). The increase in the rate of familiarity (extremely and very) from less than 20% to about 87% of the students after the inclusion program is remarkable. By Winter Break, 4 (17.39%) of the students still wanted to be Peer Mentors in the music class and it was the exact class they wanted, followed by 9 (39.13%) students who kind of wanted it and were learning to appreciate the class, 7 (30.43%) students who were willing to stay in class and it wasn’t too bad, 1 (4.35%) student (did not want to be in class), with 2 (8.7%) students not having an opinion on this question (Item 8). Before the inclusion program, there were 3 (13.04%) students who “wanted a lot” and 1 (4.35%) student who “kind of wanted to be” a peer mentor (Item 7), as compared to 13 (56.52%) after the program, again showing the increased rate in the willingness to be Peer Mentors after the program. Finally, 8 (34.78%) students thought they greatly improved as Peer Mentors, followed by 12 (52.17%) students (somewhat improved), 0 (0%) students (a little improved), 1 (4.35%) student (not improved) with 2 (8.7%) students not having an opinion on this question (Item 9). Twenty (87%) of 23 students expressing their mentoring skill improvement demonstrates that student mentors perceived that they learned mentoring skills during the inclusion programs. When peer mentors were asked if they would want to be a Peer Mentor again in middle/high school (Item 10), only 8 (34.78%) said Yes, whereas 15 (65.22%) said No. As compared to the increased positive responses after the program in other items, the result on this item was rather unexpected. However, this may demonstrate the reality of peer mentoring. For example, reflections of Peer Mentors (see below) indicated that they felt intellectual and emotional challenges during mentoring. The hope was that this program might encourage students to seek out mentoring programs after the current school year. Hopefully the eight students will continue to sign on to be Peer Mentors in addition to other new peer mentors. Teacher observations. Increases in student interaction among all students, especially mentor/student relations, were observed. At various times throughout the school year, video was taken to document student interactions during small and large group sessions. These videos, when reviewed over time, revealed mentors becoming more comfortable working with students, regardless of the disability, to the point that outside observers were not able to discern, many times, who were the general-education students and who were the special-education students in the classroom. Student reflections. Students wrote their reflections in the form of a journal. The written reflections were used to inform teachers about how the students were ‘feeling’ during the class, working with their “buddy” and the other students in the class. The students reflected each Friday when the SDC students did not attend class due to their own field trip schedule. They would reflect about how the week went with their “student,” reflecting on successes and challenges they had throughout the week. If the challenges were significant, if the mentor felt they could not handle them on their own, then they would share with the Music teacher to discuss possible solutions. If it was really a challenge, the information was shared with the Special Education teacher. Sometimes more mentor training would be required, or, in the extreme, the student and/or mentor would be switched to another student/mentor partnership. Sometimes, it was a matter of switching seats with another student. No matter what, the student reflections helped guide the pace and the interactions of the program throughout the year. Student reflections are valuable for continuing the peer mentoring program. Overall, the research outcome was very positive, suggesting that the music inclusion program should continue. Learning from the current practitioner-research outcome, the program will be improved constantly. This research indicates that teaching Music in a Full Inclusion Class does work. Forming partnerships between students with and without disabilities has had a positive effect on students’ perception of peers with disabilities. The increased positive perception between the mentors and students (going both ways as trust developed) grew to a level of visible peer bonding and communication unique to specific partnerships with the result that, with no prior musical knowledge, “students” were able to read and perform rudimentary music in front of a large audience of family and peers in multiple evening concerts. Additional positive effects of the research intervention have been observed well after the completion of the intervention. Four notable observations are presented here. First, campus community perception prior to the program was neutral at best but now is more positive, especially following a performance that included the students with disabilities. These student performers are greeted in the halls and lunch court with more energy and frequency than before the program started. Second, the confidence of our students with disabilities is much greater than before the program was implemented. This is demonstrated by their ability to lead the group on their own without assistance from their mentor. Third, the positive parent and caregiver responses to the inclusion program were not anticipated. There is an axiom among band directors that, at the end of the day, all parents really want from a performance is to see their child on stage, happy and engaged; it is a photo-moment of pride. This year, standing room only was available at the last performance compared to many empty seats a year earlier. Fourth, musicality and a drive to perform well have surpassed expectations. Our students with disabilities have demonstrated in class the understanding of what “sounds bad” and what “feels/sounds right” through the response of their teacher, mentors, and audience. Beyond the research period, the inclusion program continues to be a rewarding experience for student and patron alike. Student reflections and continuing mentor/student friendships clearly indicate a new appreciation by general education students of students with special needs. Luxton, R. A. ( 2001). Music class from the perspective of one special needs student in an inclusive/mainstreamed setting (Unpublished master’s thesis). Oakland University, CA, USA. Moss, F. W. Jr. (2009). 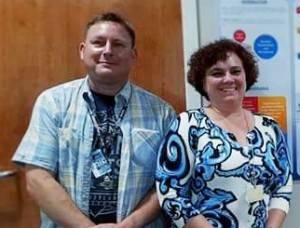 The purpose of the present study was to report on the mainstreaming and full inclusion experiences of secondary school instrumental music students who were blind or visually impaired (Unpublished doctoral dissertation). University of Michigan, MI, USA.